The limestone islands of Three Marys Cays, North Caicos. This secluded area is a great place to explore. It can be a bit confusing to find, so check out our maps. The turquoise and blue waters . 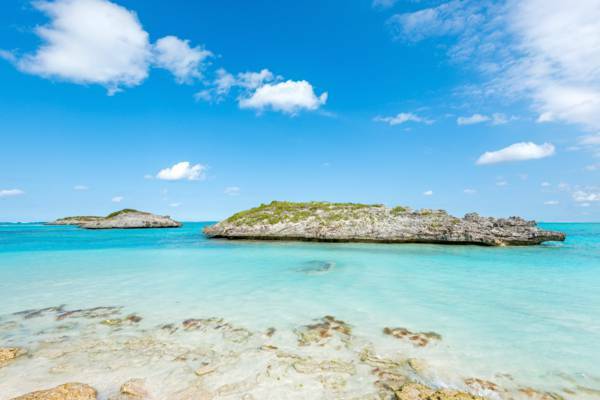 Three Marys Cays are three limestone ironshore rocks found close off the north coast of North Caicos. The general area is quite scenic and uninhabited, making it a popular spot to visit for day trips, picnics and beachcombing. Like much of the coastline on the island, water conditions are typically mild and perfect for swimming. There can be a little floating seaweed at times, but rarely enough to be bothersome. This area is bordered by the beautiful Hollywood Beach to the east and Sandy Point Beach to the west. When in the area of Three Marys Cay, nature enthusiasts will appreciate the saline wetland of Pumpkin Bluff Pond, Moore Hall Pond, and Mud Hole Pond. These systems support a wide range of wading and coastal bird life, including great herons, yellow-crowned night herons, tri-coloured herons, reddish egrets, great egrets, ospreys, and several types of ducks. Groves of the hardy thatch palm (Coccothrinax inaguensis), which is endemic to the Turks and Caicos and Bahamas, can be found along the coast west of Three Marys Cays. These little palms offer scenic patches of shade. Three Marys Cays, North Caicos. The snorkeling from shore on North Caicos isn’t great compared to the other main island in the country, however, this location is the top easily accessable spot on the island and small amounts of coral, small colourful reef fish and the occasional stingray can be seen. Conditions here vary and on some days it’s totally unsuitable for snorkeling due to poor visibility caused by wind light surf. Check our wind forecast for a prediction of the conditions. Generally, if the breeze is less than 10 knots (18kph), the ocean will likely be calm and clear. As is exhibited on many of our limestone coasts, the rock of the cays has been undercut by the action of the ocean to the high tide point, and in places overhangs almost 12 feet (3.6m). Chitons molluscs and sea urchins make the ledges and crevices their home, and add to the underwater menagerie. Due to the overhangs, it’s actually quite difficult to climb onto the cays. Don't miss the small sign to Three Marys Cays! 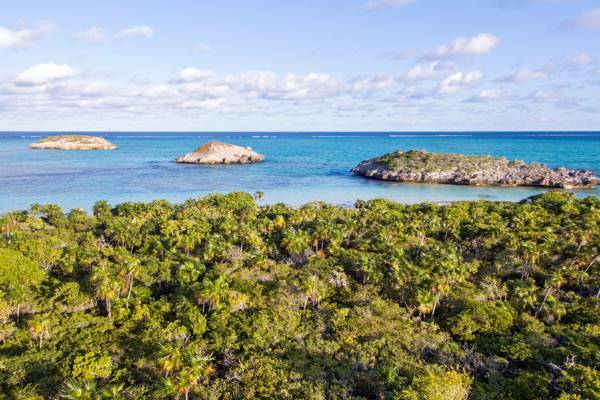 Until recently, Three Marys Cays could only be reasonably accessed from the Whitby part of North Caicos, but due to road improvements, it’s now easiest to drive from Sandy Point. Follow the road out of Sandy Point Marina for two thirds of a mile (1km) and then turn left onto the unpaved road. This road doens't have a name or sign at this time, yet is newly resurfaced. You’re on the right road if you can drive more than a thousand feet (300m). Continue for 1.85 miles (3km), and you should see the small sign for Three Marys Cays on your left. Turn on to this one lane track and follow for 2000 feet (610m) to Three Marys Cays. This track will have an abrupt left, and then a right before arriving at the cays. The road that leads to Three Marys Cays isn’t the best condition, yet can be traversed by any of the island’s rental cars if taken at a slow pace. 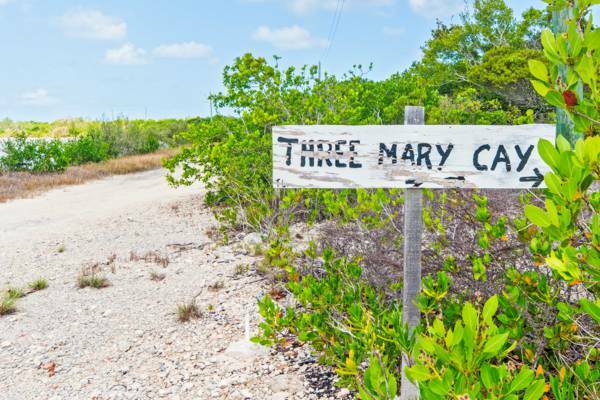 Three Marys Cays can be a little difficult to find, so don’t miss the small sign. This is the main access for Three Marys Cays. Thumbnail map data © OpenStreetMap. Last reviewed by an editor on 9 June 2017.